As the head of product safety at Herbalife and a former director of dietary supplements at the U.S. Food and Drug Administration, protecting the public and providing safe nutrition products is a priority for me. That’s why we’re pleased at Herbalife to support the Council for Responsible Nutrition’s (CRN) proposed dietary supplement product registry. The proposed dietary supplement product registry will contain basic product information accessible to anyone along with in-depth details for FDA regulators and retailers. Participating manufacturers can add their products at no charge. The registry is an industry effort to build consumer confidence. It will help us defend our industry from bad actors and from companies that spurn regulation. It will also separate the legitimate manufacturers making healthful products from less reputable operators. We make dietary supplements at Herbalife, though not all Herbalife sales and tax payments are attributable to supplement products. As a CRN member, I have been an advocate and thought leader for pushing this database through. The new registry will complement the existing National Institutes of Health (NIH) Office of Dietary Supplements (ODS) Dietary Supplement Label Database. The ODS Label Database is an important tool for the scientific research community, but it contains some gaps that the new dietary supplement registry can augment. The new dietary supplement product registry is needed because more Americans are taking supplements on a daily basis than ever before, which means that product quality and safety is essential. More than two-thirds of American adults take dietary supplements each year.According to a new economic impact report produced by John Dunham and Associates for CRN. 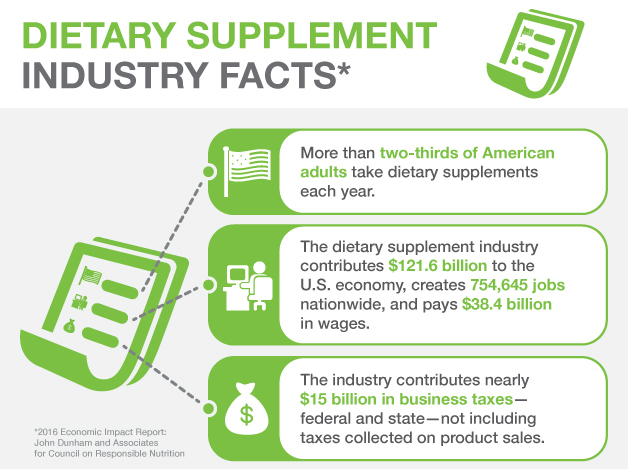 The dietary supplement industry contributes $121.6 billion to the U.S. economy, creates 754,645 jobs nationwide, and pays $38.4 billion in wages. The industry contributes nearly $15 billion in business taxes—federal and state—not including taxes collected on product sales. As an industry leader in supplements and a thought leader in nutrition, the new dietary supplement product database is inline with our Seed to Feed commitment to product quality, safety and transparency. Improved oversight for FDA officials and regulators, such as information on ingredient origins, where products are made and labeled, etc. In-depth nutrition information for consumers including extra details not found on the label, specific claims, certifications, etc. Ingredient sourcing information for manufacturers and retailers and an up-to-date list of approved ingredient suppliers. The dietary supplement label transparency work group, of which I am a member, was formed to develop the parameters for the product registry. The registry will contain comprehensive information gathered together in one place for the first time. For instance, the FDA does not currently have a database showing details about where individual supplements are manufactured; the new registry will provide that information. Work on the new registry is moving along. We pass an important milestone this month with the selection of a vendor to build and host the registry. It will initially serve regulators and the retail community, with the ultimate goal of providing industry accountability to consumers as well.